Our focus this month is on houses with a strong connection to the outdoors. We’ve picked two houses – our Bellevue Hill house, and our Block House, Pearl beach that have been purposely planned to provide a seamless transition from the indoors out. Our Bellevue Hill house, pictured below, was planned so that each living area had direct access to the garden or courtyard. 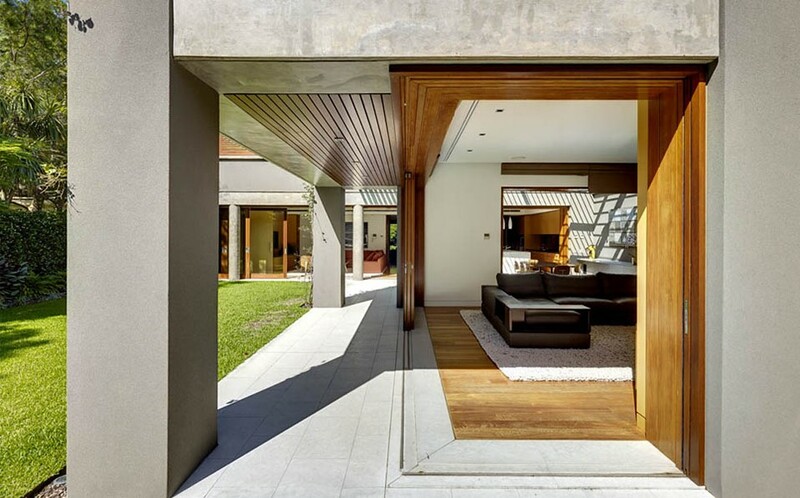 Using floor to ceiling glazed sliding doors, with some retracting into the wall cavities, allows for a greater flow to the outdoors and vice versa. When all the glazed doors are fully open, the family, living, dining and kitchen areas become one interconnected space focused around the north facing garden. Another nice feature in this house is the glass roof over the casual dining room (pictured below). 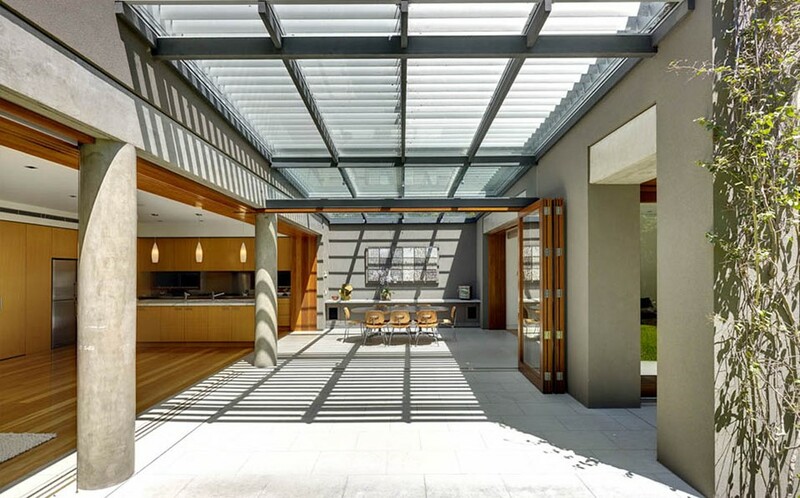 Operable external louvres over the roof provide shade when required, but also give a wonderful texture of light, again bringing the outdoors inside. 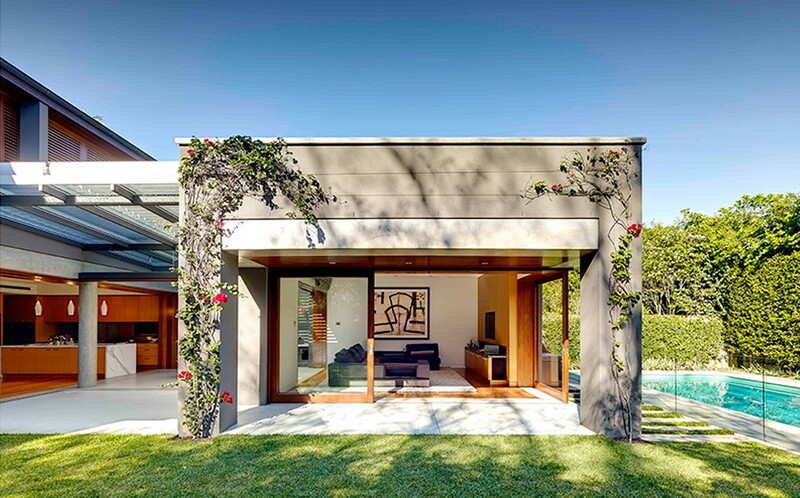 The verandah wraps itself along the perimeter of the rooms facing the garden and in a sense extends the inside out. The ceiling of the verandah is lined with timber boards which compliment the timber work of the interior. 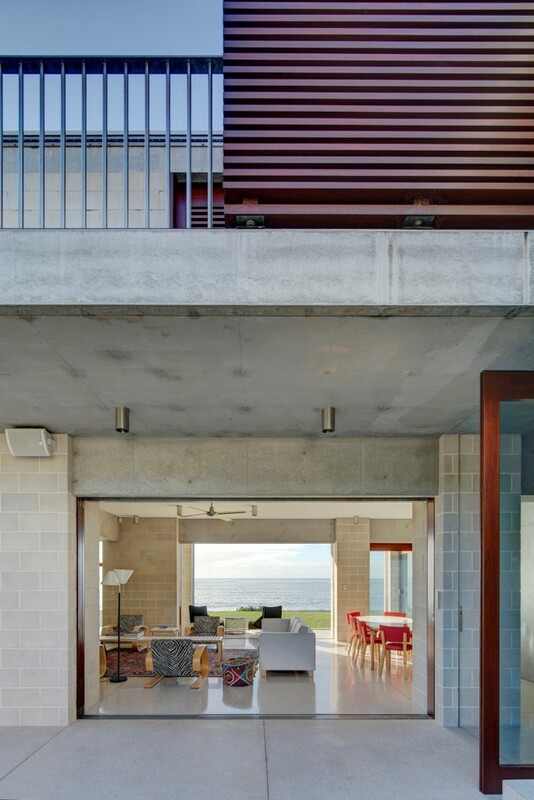 Our Block house in Pearl beach house was an obvious selection for this topic. 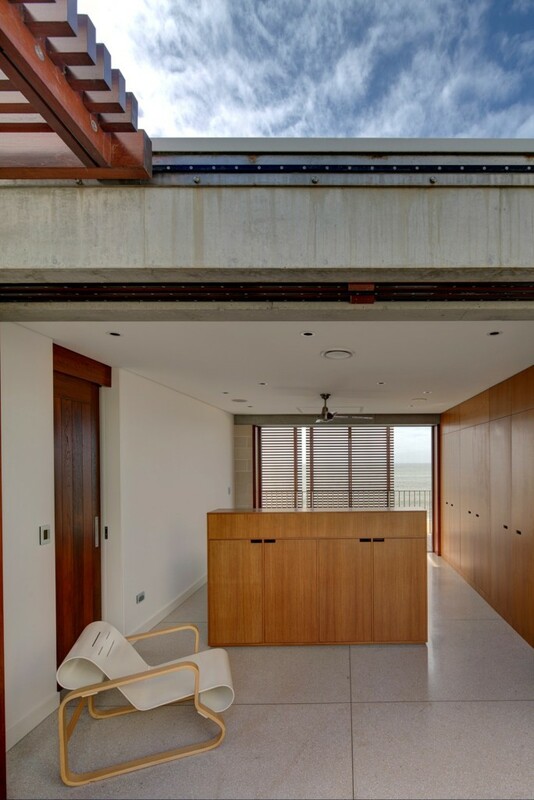 The house is planned around an internal courtyard, with the main living, dining, kitchen areas facing out to the sea and also inwards to the courtyard. Sliding timber shutters and cavity sliding windows and doors allow spaces to open seamlessly, blurring the demarcation between inside and outside. The terrazzo floor extends from the interior out and the sliding door tracks are fully recessed into the floor. Off-form concrete and blockwork is the main element that is carried through from the outside to the interior of the house. Each room in the house enjoys visual and physical connections to the outside – by the use of the operable layers on the façade. With flexible, smart planning, most new houses should be able to seamlessly offer the option of opening up to the outdoors which in turn maximizes both the interior and exterior spaces.